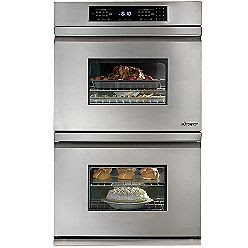 The appliance of the week is the Dacor Millennia Distinctive 30" single wall oven. Dacor is an all-American family-owned appliance company, and their cooking appliances are designed and manufactured in the United States. Their focus is on fit and finish, superior materials, and professional-level performance. The Millennia Distinctive wall oven is a prime example of this dedication to quality. The lines are clean, without any protruding handle. Rather, there is an inset handle so everything is at the same level. When the door is opened, the premium quality is evident in the way the stainless wraps around the door. Rather than just a cut sheet of stainless steel with unfinished edges, they've actually rolled the edge in so there is no sharp edge. It may seem like a small thing, but it makes a big difference to its appearance and the feel of it. When you look inside, the interior and the inside of the door are jet black. The black color not only makes it look nice and shiny, but it's also easier for the people who make them to detect flaws in the finish. Another detail that seems small but makes a big difference in quality. And, the black porcelain is thicker than average porcelain interiors, which makes it even more durable. 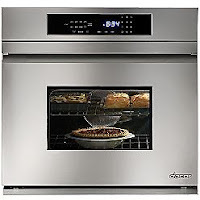 One of Dacor's signature features is Pure Convection. A 2200 watt convection heater around the convection fan heats air that gets circulated through the oven cavity. A filter in front of the fan absorbs the odors inside the oven while Pure Convection is running, so you can cook bread and garlic at the same time and not end up with garlic bread! You'll be able to cook more things simultaneously, saving time and energy. Three racks give you plenty of room to bake cookies or other goodies. With Pure Convection, you can use all three racks and bake three trays of cookies at once. Or, you can use convection bake, which runs the fan and the lower element, convection broil, which runs the fan and the upper element, or convection roast, which runs the fan and the upper and lower elements together. There is a temperature probe, so the oven can monitor your food as it cooks. And, with halogen lighting inside, it's easy to see your food cooking. Sabbath mode allows the oven to be used even on the Sabbath for those who are observant. Superior cooking starts with superior tools, and the Dacor Millennia Distinctive 30" wall oven is an excellent starting point for a kitchen remodel or as a replacement for an existing electric wall oven. If you need a double wall oven instead of a single, there is also the Dacor Millennia Distinctive 30" double wall oven. All the features described above, plus another oven with all the same physical features, and the ability to bake or broil (no convection).